Like colleges and universities, boarding schools demand greater energy use than, for example, a typical high school. With dormitories, academic facilities, athletic centers, and dining halls, providing equally high standards of operations, maintenance and energy savings across each and every building can be a challenge. Boarding school campuses often incorporate buildings that are over 100 years old, and maintaining that traditional setting is critical to many schools. Integrating new building trends and modern can be difficult while also trying to maintain the historical feel. In addition, new construction over the years means that many campuses blend the old with the new, requiring different strategies for maintaining both types of facilities. In the past, maintenance and operations were the main focuses of education institutions’ facilities management departments. Now, sustainability and energy management have become much higher priorities, and facilities managers are responsible for helping the school reach its goals. Many boarding schools across New England are committed to reducing their environmental impact. Not only are schools interested in cost savings, but green initiatives are often incorporated into student life. Controlling energy use across facilities is a vital way to support these green initiatives and contribute toward the school’s environmental goals. Boarding schools don’t need to make large, expensive capita; investments to optimize their energy performance and gain a high ROI. There are simple, cost-effective ways that schools can optimize their existing energy infrastructure while helping their bottom line and meeting their commitment to sustainability. One of the simplest yet most overlooked ways for boarding schools to gain ROI is by investing in improved performance of their boiler and mechanical rooms. There are three simple steps to optimizing the energy performance in these areas. The first step toward implementing or optimizing mechanical insulation is scheduling an insulation energy audit. This professional report shows how much (if any) energy your system is losing due to missing or damaged mechanical insulation, and provides details on the money and energy you can save by upgrading your system. The three steps outlined above are relatively effortless ways to eliminate unnecessary spending on process and boiler inefficiency. 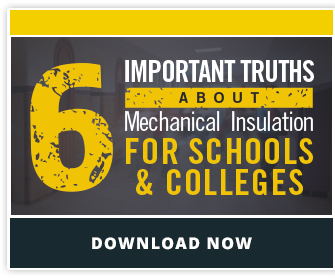 Every Facilities Manager at a New England boarding school should book an insulation energy audit for their schools today—find out how much money and energy your institution can save!